The Dodge or Burn tool uses the current brush to lighten or darken the colors in your image. The mode will determine which type of pixels are affected. 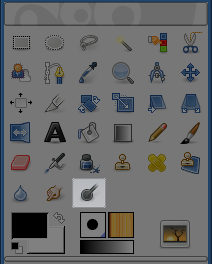 From the image-menu: Tools → Paint Tools → Dodge / Burn. or by using the Shift+D keyboard shortcut. Toggle between dodge or burn types. The type will remain switched until Ctrl is released. Shift places the Dodge or Burn tool into straight line mode. Holding Shift while clicking the mouse Left Button will Dodge or Burn in a straight line. Consecutive clicks will continue Dodge or Burn in straight lines that originate from the end of the last line. The dodge effect lightens colors. The burn effect darkens colors. Shadows restricts the effect to darkest pixels. Midtones restricts the effect to pixels of average tone. Highlights restricts the effect to lightest pixels. Exposure defines how much the tool effect will be strong, as a more or less exposed photograph. Default slider is 50 but can vary from 0 to 100.